A couple of months before the birth of our beautiful baby girl, Florence, Silver Cross very kindly gifted us their latest Special Edition Henley Pioneer. We had spent months road testing buggies, going from store to store to try out the latest push chairs and trying to work out what the hoot a travel system was! A word, that now, as new parents is just part of our daily vocab, same as “burp” , “what colour’s her nappy” and “quick, pass a muslin“… We were, as you can imagine totally blown away when we received what can only be described as the Rolls Royce of the pram / pushchair world. It is beautiful and it drives like a dream- but more on that later! Over the last few months of using the buggy I have been stopped an innumerable amount of times by mostly husbands (of secretly spying pregnant wives / girlfriends ) asking what make the pram is. It’s certainly something I am very proud to push and with its no fuss set up, it’s a joy to own. Keep scrolling down to see it in action in a little video we made. Over the last 16 weeks I have well and truly put the Pioneer through its paces. It has graced country roads, cobbled streets, a lot of hospital corridors, train platforms and many many supermarket aisles. As with any review I will ever do, this is totally honest and all opinions are my own. Silver Cross is a nursery brand and manufacturer of baby transport and other baby-related products from infant car seats, nursery furniture, nursery bedding, nursery decor, toys and gifts. Established in 1877 Silver Cross’ founder William Wilson invented the world’s first baby carriage. 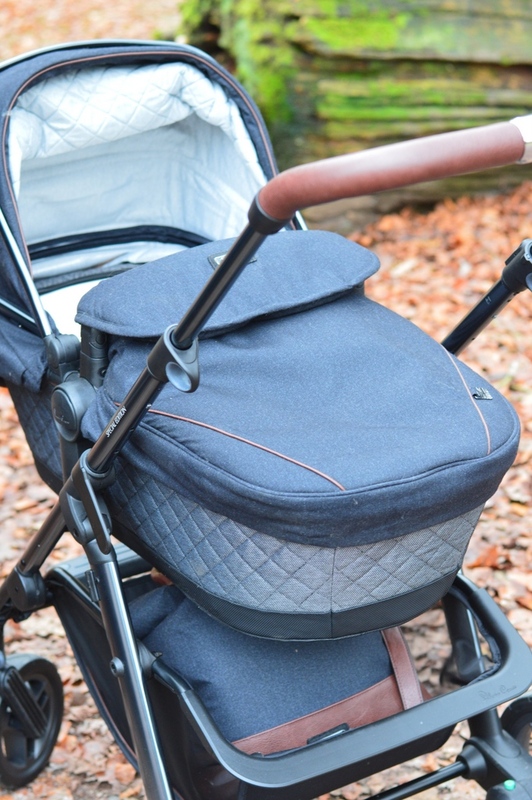 William developed an innovative spring system – the now-famous bouncing Silver Cross suspension – and combined this with a reversible hood to create the first-ever modern pram. The Henley range consists of three prams, the Wayfarer Special Edition, the Pioneer Special Edition and the Surf Special Edition. The Special Edition features tailored fabrics and fine attention to detail to create a sophisticated look that is pure contemporary chic. The luxurious inky blue fabric is complemented by exclusive details like the chocolate leatherette handle, diamond quilting and gloss graphite chassis with a matching changing bag to complete the look. One of the things I like most about the Pioneer is how simple it is to manoeuvre and easy it is to assemble. The wheels turn effortlessly and so getting around people at a busy train station, or weaving around pot holes on the lanes near our house is smooth and seamless. Changing the chassis from the car seat to the flat lay is very straightforward too and easily a one man job. There’s a simple brake system on the bottom right with a red foot pedal for brake (stop) and a green button to click to go. I have friends who have travel systems that literally require a manual to work out but this one is baby brain friendly! 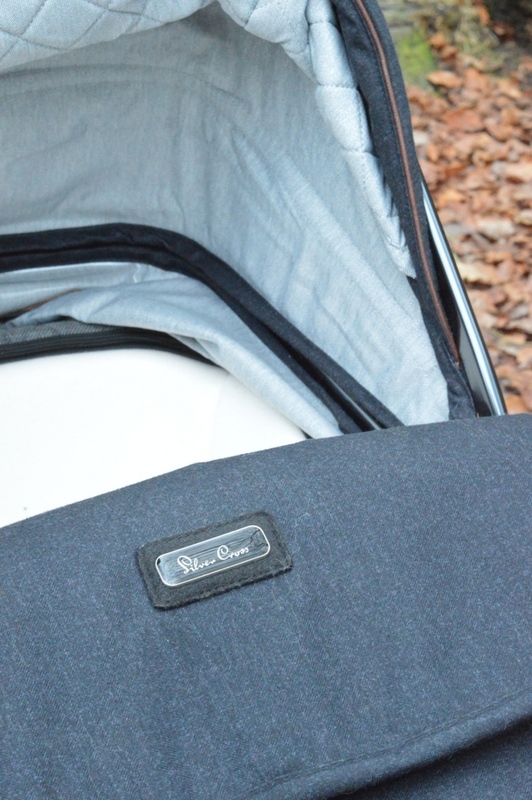 The pram is incredibly lightweight but sturdy and has a soft padded inner lining which is very comfortable for Florence and sends her in to a deep sleep almost as soon as she’s in it. It was important for me to have an all terrain pushchair as we currently live in the country side but do like to spend time in nearby towns and Cities. The Pioneer certainly works on the country roads and on some pretty uneven tracks too. The wheels are very robust, withstand mud and Autumn leaves and the overall design is very sleek and stylish, something to be very proud of. The handles are beautiful, with a faux brown leather. They are soft but firm and can be adjusted to four separate heights. The chassis is very easy to fold down in smooth movement. It’s easy for me to lift in to the boot of the car and fits in comfortably with the newborn pram / flat lay. The reason I chose the Pioneer over the Surf or the Wayfarer was because the basket underneath is huge. I am definitely someone who goes in to the supermarket to buy just ONE thing and ends up coming out with four bags full. So, now having a very generously sized basket I can warrant every extra item I add in to my shopping basket! Florence is too small yet to use the seat unit but for the purpose of review I did take her out in it a couple of times in her Winter bear suit, just to test it out. The harness is easy to clip her in to and seems comfortable. The sheepskin lining is incredibly luxurious too. Florence loves looking around and I know that once she’s a little bigger she’ll love it. It can be difficult to access the basket when you have the flat lay (pram) in place. I tend to put the changing bag in the basket before I click the pram on top which can then be hard to get in to once in a nappy based emergency! The manoeuvrability is very good on uneven surfaces but it can be a little heavy when mounting kerbs. The lightweight chassis folds incredibly small, and with a lovely leatherette handle, it’s a joy to push. Finished in Special Edition gloss graphite. This newborn lie-flat carrycot is included in the Henley Special Edition package and is also suitable for overnight sleeping. The Pioneer Henley also comes with a beautiful co-ordinating changing bag. Sumptuous faux fur liner will keep your baby comfortable and snug and looks stunning set against the rich inky fabric. The Special Edition lightweight chassis is finished in high quality, hard wearing gloss graphite for understated style. Where to buy the Silver Cross Pioneer from? The RRP of this travel system is £845 which is a lot of money, but seems to be pretty average in terms of other high-end travel systems. The Simplicity car seat is an additional £135 and the Isofix (optional, of course) £120. As far as travel systems go I couldn’t be happier with it or recommend it highly enough; its quality, manoeuvrability and design are exceptional. Great review and video! Would love to see more videos in 2017…adds so much to see the buggy in action. Florence looks divine! Great review, although we aren’t in the market for a pram, we have an uppababy vista from our first baby almost 5 years ago and it’s neve let us down. Mostly wrapping our new baby though, both my husband and myself prefer it to a pram in most circumstances.